An Inexpensive Lifetime Warranty Socket Set From Husky – Check It Out. In all seriousness, it blows my mind how much of a socket set you can buy for just over a hundred bucks. This is a 105 piece socket set from Husky. I’ve been turning wrenches since I was a young child so it’s pretty easy for me to point out what works and what doesn’t. This kit certainly works as it should and is an ideal set for the DIY’er and average wrench turners. These tools are black anodized; not be confused with black oxide found in typical impact socket sets. But realistically, you and I both know that if the situation calls for it, some of your sockets will certainly find themselves on the business end of a cordless impact driver : ) for most light jobs, an impact driver is not going to destroy or damage your non-impact rated sockets. Once you start getting into larger bolt sizes and more demanding torque loads – buy yourself an impact socket set. If that’s not your focus, then this set is money well spent. The black finish is pretty clean looking. Aside from the looks, the black finish makes for a perfect contrasting color for the laser etched size on each socket. The smallest socket is a 5mm and the size is clearly legible at arms length. If you’ve turned wrenches for any amount of time you already know how valuable it is to simply glance at the tool and be certain it’s the right size. The old days of lightly engraving the numbers followed by squinting and slowly rotating the socket to learn the size are thankfully behind us. Husky designed the sockets and end wrenches in this set with 12 contact points which focus the contact pressures on the flats rather then the corners of a conventional hex head bolt. This is fairly new technology that seems to have caught pretty good traction. Husky claims these work wonderfully on rounded bolt heads since they do not rely on a good hex head corner geometry. It’s funny though because while I’ve been using this set preparing for a write up, I have not run across any rounded bolts to really vet the technology…lucky me? The 12 point geometry works with more than just hex heads. Surprisingly, these will also grab on to external torx heads also. This set would have really come in handy a while back when I was working on a German car that was littered with “E-torx” throughout the entire engine bay. Have you ever been in a tight spot with your ratchet and just barely run out of handle room before the next pawl engages in the ratchet head?…we all have, and typically there are a couple of bad words in there at the same time. Well husky heard your frustration and offers these ratchet heads with a 100 tooth ratcheting gear. The quick math shows us that’s only 3.6 degrees between pawl engagements which really lowers the amount of room needed to operate your ratchet. All of the sockets have a knurled surface toward the base of the socket. Husky knows you’re going to be in a position where you need to turn the socket with your fingers…. there is no getting away from it. With that, they offer a fairly deep knurling that feels super aggressive when you’re trying to turn the sockets with your finger tips. They’re very grippy. Also along the lines of finger turning, each socket has a tapered shoulder at the base of the socket to reduce the outside diameter just a bit. This improves the mechanical advantage you have when using your fingers to turn the socket….that is to say, the hand is stronger as you get closer to a closed grip position and the smaller diameter helps out in that area. My favorite tool in this kit has to be the 3/8” palm ratchet. It’s one cool tool : ) I have a really older model palm ratchet that will damn near cut your hand open if you put too much torque into it because the handle design is garbage. The one that comes in this kit is nice and smooth to the touch and feels super comfortable in the hand. The sneaky squarely cool points come from the gimbal arrangement of the turning grip. It is pinned on 2 different axes. Since it pivots on 2 different axes, it feels buttery smooth as you use it and it follows the natural motion of your hand; a lot like the way a U-Joint feels without any noticeable binding. 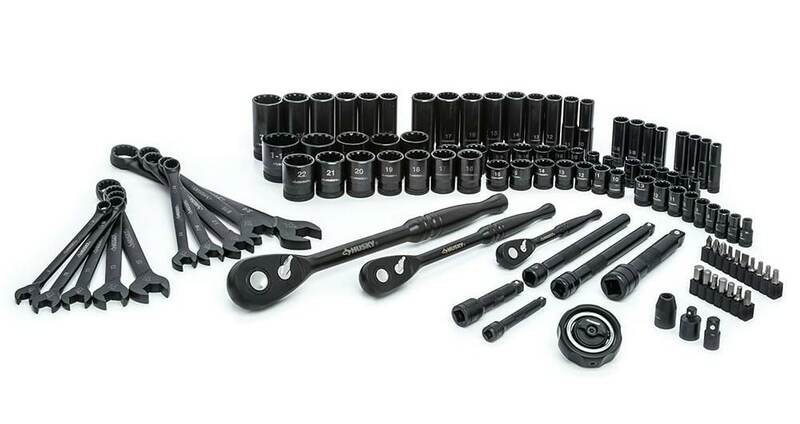 For just over $100 I really don’t think you can go wrong with this socket set. There may be differences that are noticeable to some between this unit and a comparable kit from snap-on in terms of longevity, but I think that the vast majority of consumers would be plenty satisfied with the capabilities of this kit. A comparable kit from Snap-On would likely be north of $600-$700 or so. However, say you break any one tool in the entire kit, just bring it in for a free replacement. Husky is now offering a lifetime warranty on hand tools – no questions asked. You don’t even have to be the original purchaser or even possess the original receipt. Again, it’s just over one hundred dollars and is well worth the money in my opinion. I appreciate you stopping by to learn more about this socket set from Husky. If you are interested in getting your hands on one of these kit, consider using this link or one from above. These are affiliate links and provide a small kick back to the website which help to keep it alive and kicking. Either way, I really appreciate your support.